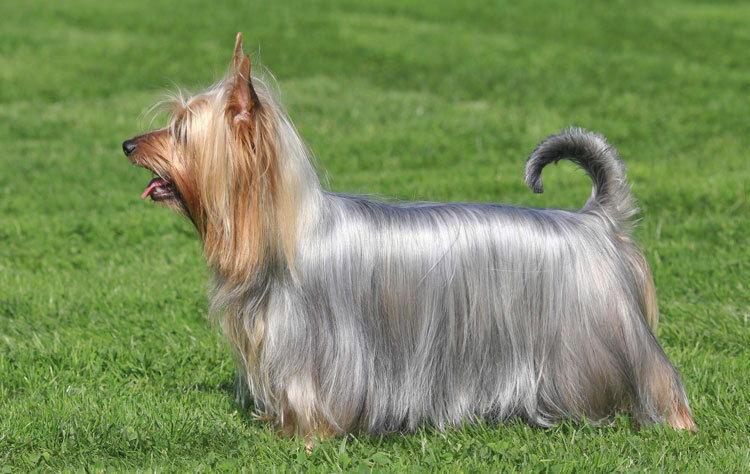 The Australian Silky Terrier was originally bred from crossing Yorkshire and Australian Terriers. The Silky is a stocky toy breed that loves attention but values its independence. Firm training will help make the Silky an ideal housedog. Silkies still possess a strong terrier instinct, which makes them an excellent hunter of vermin. Despite their glamorous appearance and small size they are most definitely not lap dogs and much prefer to be treated as an equal member of the family. Wonderfully loyal and sensitive, they will gauge your reaction to people before deciding whether to befriend or chase. The Breed Standard stipulates a weight of around 4kg and a height of 23cm. Generally free of major congenital health issues, the average lifespan is between 12-15 years. The Silky is a hardy dog and little special care is needed. Providing they are fed on a well balanced diet and given a reasonable amount of exercise then all should be well. Take care to socialize them well, particularly if they will be around children.